Here at Qhaus we take development very seriously and we made a commitment to improve constantly the way we work. We are now upgrading our main saw to a fully automated Weinmann machine that will work in perfect integration with our ERP system. Qhaus began production of prefabricated wooden element houses in 2006. Since then, hundreds of houses have been produced and delivered to several European Countries. Production starts by cutting to the right lenght the thousands wooden parts composing the timber-frame elements. The cutting process has always been automated and so far it was carried out using an Italian sawing machine: the Stromab CT600. Today the Stromab CT600 is being replaced with a brand new Weinmann WBS120. The main reason for this upgrade is that the Stromab has very limited degrees of freedom for cutting. 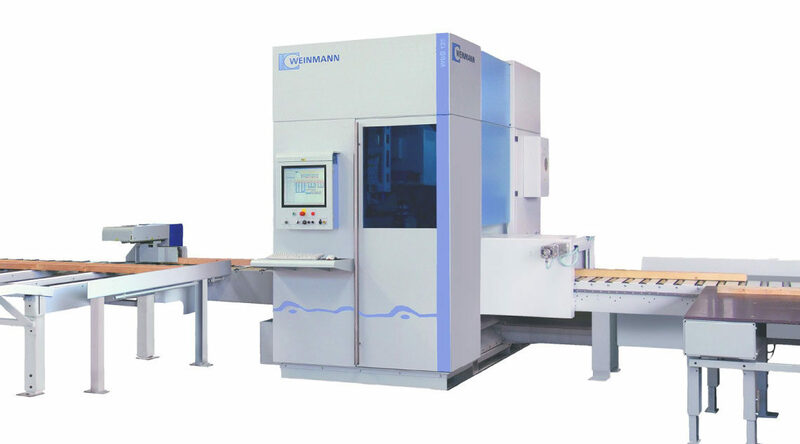 The new Weinmann WBS120, with its 6-axis cutting tool, offers instead unilmited cutting possibilites. The Weinmann offers also the possibiliy of labeling parts and marking reference lines directly on the wood… which can greatly help in the assembly phase. Since the end of 2013 Qhaus has been investing in development. We began by developing our own ERP software and later we adopted the 3D BIM design software “Vertex”. These choices were aimed to put ourselves in the position of introducing more automation on the factory floor. Today we are finally moving on to the next stage: using everything we learned so far to improve production speed. The image above summarizes the statistic of the logs gathered during 6 months of production activities. 6. preparing the assembly tables for the production of the next element (gaps). The Weinmann WBS120 can improve the production speed of mainframe, exterior battens and exterior cladding… processes which time sums up to 55% of total production time. We estimate that by using this automatic saw we can speed production up by 20%, improving also the quality of the product (more precise cuts and measures) and the working conditions of workers (less manual cuts and less cross-checking work on the measures). The ERP system will keep an eye on production speed and it will make available clear reports. We’ll let you know about our progress! For more info or for any request please contact our Sales Team.